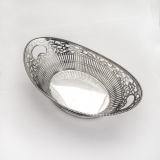 Dutch 833 Standard silver oval ornate bowl or basket with intricate cut out designs, date marked for 1902. This elegant basket is 9 7/8" across the handles, 5 3/4" wide, 3 1/8" tall and weighs 308 grams or 9.9 ozs Troy. The soft, warm, original finish is present, with no buffing or machine polishing. The excellent original condition and clear, crisp detail, with no removals, repairs or alterations, make this an especially attractive offering. Antique Dutch 833 Standard silver Etui or Necessaire with pen and other grooming tools, date marked for 1818 Netherlands. This handsome box is 3 1/4" tall, 1 1/4" wide, total weight is 96.4 grams or 3.1 ozs Troy. The soft, warm, original finish is present, with no buffing or machine polishing. The excellent original condition with no monograms makes this an especially attractive offering. Dutch miniature working figural drawbridge 833 standard silver, c.1900 maker's mark PH crescent moon. This whimsical, scarce and desirable miniature is 3 3/4" long, 1 3/4" wide, 2 1/8" tall and weighs 65 grams or 1.1 ozs. Troy. The excellent original condition and clear, crisp detail, with no monograms, removals, repairs or alterations, make this an especially attractive offering. 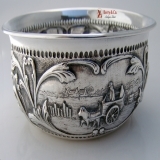 Dutch 833 standard silver cut work heart basket having an applied beaded rim and base, date mark for 1922, maker's mark KB, under a crown and over a chevron. Weighing 89 grams or 2.9 ozs. Troy, this handsome basket is 5 3/4" - 3 1/2" and 2 5/8" tall. Inscribed as described above, the soft, warm, original finish is present, with no buffing or machine polishing. Excellent original condition and clear, crisp detail, with no monograms, removals, repairs or alterations. 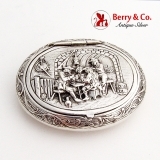 Repousse Happy Village People Scene Oval Form Snuff or Pill Box Hinged Lid Gerardus Schoorl Dutch 833 Standard Silver c. 1900, Zaandijk. This darling box is 2 1/4" long, 1 13/16" wide and weighs 29.4 grams. Antique Dutch 1st standard - 934 sterling silver large footed serving bowl having applied figural scroll & shell handles. It is decorated with the engraved floral and scroll patterns along the border. Made in 1849. This magnificent bowl is 11" long, 13 3/4" from handle to handle, 9" wide, 3" tall and weighs 504.9 grams or 16.2 Ozs. Troy. 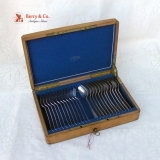 Dutch 833 standard silver dessert set for 12 in a fitted locking box having its original key, date marked for 1895 and maker;′s mark: DO over 2. Each of the 12 three tined forks is 7 3/16" long, with the 12 weighing a total of 481 grams. Each of the 12 oval spoons is 7 5/16" long, with the 12 weighing a total of 469 grams. 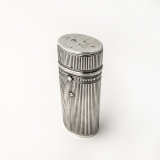 The total silver weight is 950 grams or 30.6 ozs. Troy. The fitted box is lined in plush blue velvet and has the retailer′s mark inside the lid. The gilt lettering is worn, but the seller was located in Amsterdam. The dovetail box is in very good condition, with the hinges and lid retainer operating properly. The escutcheon for the lock is missing. The soft, warm, original finish is present, with no buffing or machine polishing. The excellent original condition and clear, crisp detail, with no monograms, removals, repairs or alterations, make this an especially attractive offering. Dutch 833 standard silver large Baroque napkin ring, date marked for 1863 with the maker′s mark IK 17 and monogrammed, in period script: dBH. 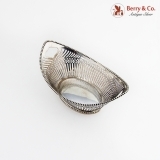 Weighing 30 grams, this large, unusual napkin ring is 2 3/8" in diameter and 1 1/2" tall. Monogrammed as described above, the soft, warm, original finish is present, with no buffing or machine polishing. The excellent original condition and clear detail, with no removals, repairs or alterations, make this an especially attractive offering. 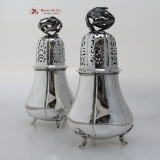 Large ornate first standard 934 sterling silver sugar shakers with open work floral finials, c.1890. The date marks are on the sleeve of the lad and are rubbed These beautiful large shakers are each 9 5/8" tall and weigh a total of 988 grams or 32 ozs Troy. The soft, warm, original finish is present, with no buffing or machine polishing. The excellent original condition and clear, crisp detail, with no monograms, removals, repairs or alterations, make this an especially attractive offering. Dutch 833 standard punch ladle in a Renaissance revival style date marked for 1894, maker′s mark R under a hammer in a square. The ornate rope twist handle has two classically styles female head medallions, one on the end of the handle shank and the other at the center top of the cast handle, surrounded by ornate floral, shell and scroll decorations. The back of the handle has an ornate, period script monogram: AGH. The single side spouted oval bowl is chased with ornate scroll, floral and foliate decorations. Weighing 82 grams or 2.6 ozs. 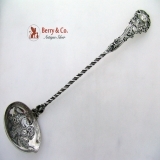 Troy, this wonderfully ornate ladle is 10 3/4" long, with a bowl 2 7/8" - 2 1/8". Monogrammed as described above, the soft, warm, original finish is present, with no buffing or machine polishing. The excellent original condition and clear detail, with no removals, repairs or alterations, make this an especially attractive offering. Dutch 833 standard silver figural open work large serving spoon by E. and G. Schoorl of Amsterdam, date marked for 1926. 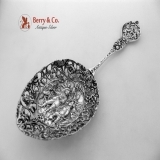 This wonderfully ornate serving spoon has it all, with a large central bowl medallion of a group of Musketeers surrounded by ornate open work floral, scroll and foliate decorations and the cast floral and foliate handle with a scene of frolicking Happy Village People drinking, smoking and entertaining. This finely detailed and well made large serving spoon has all the marks: Lion mark for 833 silver, assay mark for Amsterdam, Q date mark for 1926 and ZZ hammer maker′s mark. Weighing 96 grams or 3.1 ozs. Troy, this special spoon is 9" long, with an oval bowl 41/2" - 3 1/4" The soft, warm, original finish is present, with no buffing or machine polishing. The excellent original condition and clear, crisp detail, with no monograms, removals, repairs or alterations, make this an especially attractive offering. 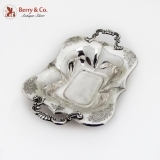 Dutch 833 standard silver baby feeding bowl with allover Repousse Scenic, floral and foliate decorations. One panel has a lakeside windmill and house with a church in the background, with the other panel showing a horse drawn cart with houses in the background. This unusually attractive bowl is date marked for 1908 and is 4 3/8" in diameter and 1 3/4" deep, weighing 96 grams or 3.1 ozs. Troy. The soft, warm, original finish is present, with no buffing or machine polishing. The excellent original condition and clear, crisp detail, with no monograms, removals, repairs or alterations, make this an especially attractive offering. 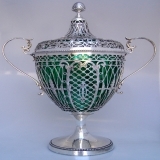 Dutch first standard 934 sterling silver Chestnut Vase with a green glass liner, maker′s marks N2, date marked for 1908 and bearing, on the vase and lid, British sterling silver import marks of Boaz Moses Landeck, London 1908. This most impressive, large Neoclassical style vase has intricately designed cut work on its body and lid, with cast ,strap work handles and a pomegranate finial. The green glass insert adds to the appeal of this special vase. This exquisite vase is 14 1/2" tall, 9 1′2" across the handles, 6" in diameter and weighs a substantial 1477 grams or 47.5 ozs. Troy, silver weight only. The soft, warm, original finish is present, with no buffing or machine polishing. The excellent original condition and clear, crisp detail, with no monograms, removals, repairs or alterations, make this an especially attractive offering.